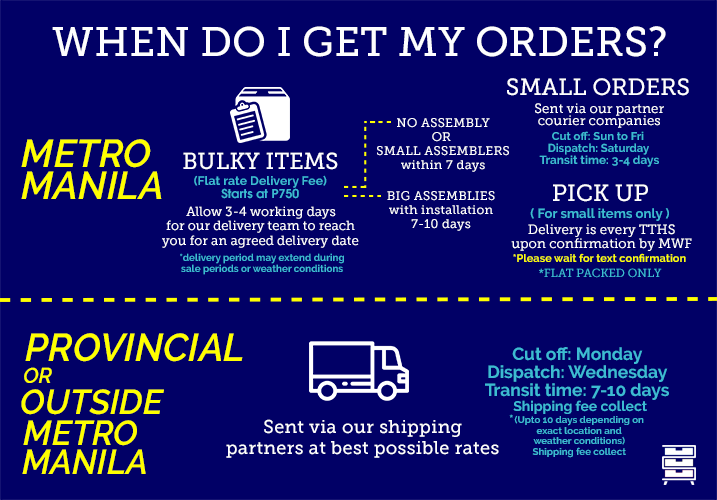 For small products, we can ship it to your address via courier for as low as Php 60 for Metro Manila and Php 90 for provincial addresses. For big products, we can do direct deliveries. Flat rate delivery fees depends on your delivery address. Yes we can assemble the furniture for you, just select the option upon checkout. All items posted are available on hand at the time of posting, unless the item gets sold out. Inquiring about stock availability is recommended. Can we order anything from the catalogue that is not posted on your site? Yes, just provide us with the article number of the product you are interested in. We’re located near the old showroom along Santolan Road. Our address is SANTOLAN TOWN PLAZA by Rockwell, 276 Col. Bonny Serrano, San Juan City. We are open everyday from 9 am to 8 pm including Sundays and holidays. Yes we are open on holidays, feel free to drop by! As shipping varies per product, shipping costs will be settled via email after your order has been placed. Sent via our partner courier companies every MWF. Allow 3 to 4 working days for our delivery team tor each you for an agreed delivery date. In store is every TTHS upon confirmation by MWF. Will be immediately sent via our partner shipping companies every MWF at best possible rates. Note: If assembly services are required, flat rate fees depend on the area. Will be immediately sent via our partner shipping companies every Mon/Fri at best possible rates. Merchandise to be exchanged should be in good, original, sellable condition, intact, unused, unassembled, without damages. Items picked up should be inspected with our representative. Choosing not to inspect will void any exchanges or parts replacement. Item for exchange must be equal or of higher value, and customer should pay for price difference. If any, corresponding delivery charges will apply for the pick up and/or shipment of the exchange item. No cash refunds shall be given. Merchandise on Sale or Promo must be paid in full and sale is considered a FINAL SALE, and cannot be returned nor exchanged. 6. Indent or Special orders cannot be cancelled or returned or exchanged. 7. In the case of delivered or assembled furniture, exchange/returned merchandise are subject to a 25% restocking fee and delivery charge. 8. As stated in all our official receipts, we do not offer warranties. Please check the condition of the goods delivered before our delivery team leaves or before leaving the pick up location. 9. Please be informed that change of mind is not a valid reason for refunds.